Since the foundation is something that needs to be installed by an expert contractor, and not much can be done with it after it is placed, only a few tips are provided below. Although few, they are crucial. No matter what type of foundation you select, keep it as dry as possible. 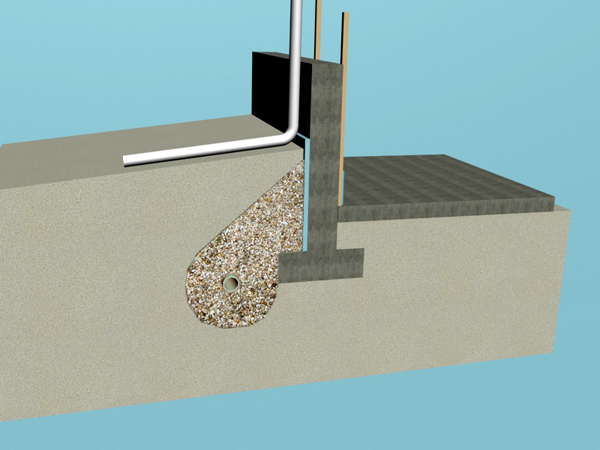 Foundations can act as a heat escape and damage the efficiency of a passively heated home. Fly-Ash Concrete. Fly ash is a waste product from coal-fired power plants and instead of being dumped in landfills, it can be used as a substitute for 15 to 30 percent of the Portland cement in concrete, thus the name fly-ash concrete. Fly-ash concrete is smoother, denser, more workable, and less permeable than conventional concrete and is widely available. Concrete or Concrete Blocks offer little or no insulation. Filling the cores with polystyrene beads and vermiculite, heat flows through the mortar joints (bridging loss). It is best to build a block wall and apply internal or external foam insulation to the foundation wall. Faswall Block consists of concrete and wood particles (waste products) molded into blocks. They are lightweight and thus relatively easy to work with. As with ordinary concrete blocks, insulation is required to reduce heat loss. Rastra Block is made from cement and recycled plastic and can also be used to build foundations and walls. Rastra blocks are lightweight and easy to handle and can be cut easily with a saw. Basement walls, Stem walls and slab-on-grade foundations are usually insulated with 4" thick rigid foam, inside, or outside. External insulation may be open to the environment and subject to damage. Termites and other insects may eat their way into foam to the rest of the house, reducing the R-value of the insulation. Internal insulation is becoming more and more popular and effective as long as external moisture protection has been applied. Keep the foundation as dry as possible! Wet earth around a home acts as a giant heat sink. Moisture in wet soil may be drawn into the walls of a home, where it can dampen and damage the insulation due to mold and mildew, eventually causing framing members and sheathing to rot, leading to structural damage. A sloped, well-drained site or grading-sloping the ground away from the foundation is the most effective and easy way to create a dry foundation. 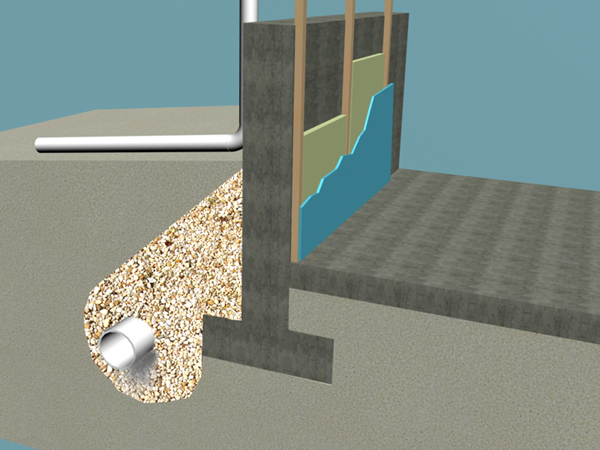 If a slope is directed toward a home, it is best to create earthen dams or French drains (a rock-filled trench with porous pipe or tile running along the bottom, which is pitched to drain by gravity away from the house - Filter fabric is typically placed over the pipe to prevent sediment from dogging the openings in the pipe) channeled around the house to divert the water. It will help to have trees or shrubbery planted to soak up the water.